Vanessa from V and Co.
hi there moda-ites this is Vanessa of the V and Co blog and of V and Co patterns. allow me to introduce myself to those of you who don’t know me. i’m a mom and a wife, and my husband and children are my world. but while they are at school and work, i get to create patterns, sew, and i write on my blog weekly ramblings of my daily life of being a mother of 4 kids, which can be pretty funny at times. on my blog i create free tutorials on how to create fun things for your home, your friends, yourself, or your kids. i also update my readers on all my newest patterns for sale. its a great past time that blog of mine, and i’m happy to write my musings to so many friends. so a little about that shop i have. the abby bag, which is a great bag that can carry just about anything. it’s reversible, and the bow can be converted into a scarf. definitely a fan favorite. and lastly my beach bag pattern (which should be renamed “everything but the kitchen sink bag”) because you can fit just about that! it’s a great bag that can used for so many versatile things. i use mine weekly to tote all the “mother” stuff as well as my stuff. these three are my first to make it into paper pattern, but keep an eye out for more to keep popping up as the months continue. i am super excited to keep creating and moving forward in the paper pattern industry. 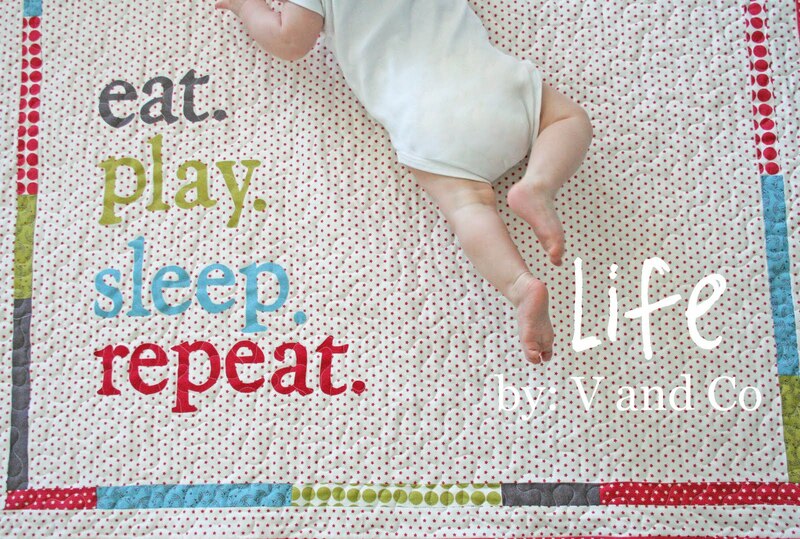 this baby life quilt one is one of my favorite i made for them. you can also see my projects in magazines and books, and my own book is coming out this january of 2012.
i consider myself very lucky and blessed to be able to do what i love from my home so i can be there when the kids come home from school. i hope you enjoy my patterns as much as i do! thank you so much for letting me come today and share a little about myself! By Guest BloggerIn Uncategorized9 Comments on Vanessa from V and Co.
Next Next post: How Big is Texas? Camille introduced me to you. I’m so excited to see you doing so well. Congratulations! I can’t wait to get your book! The baby quilt is one of my favorite, so cute! I just love all your tutorials and cannot wait to see your book! I LOVE your patterns and your blog and am so excited about your book! Congratulations!